To give or receive a cheerful bouquet of flowers is delightful. But perhaps this Valentine’s Day, you’d like to give a gift that is a bit less common. We may be a bit biased as SFC’s Grow Local gardening team, but we think that it would be much more exciting to give your loved one a home-grown, edible bouquet! There are plenty of plants growing in gardens right now that you can use to whip up a stunning and delicious Valentine’s Day bouquet. Nasturtiums love the cool weather season in Central Texas. These gorgeous edible flowers come in a range of colors, from rich red-orange to brilliant yellow. They can be added to a salad or popped in your mouth for a burst of peppery flavor. Broccoli that has bolted (flowered) is magnificent! Each of the tiny buds on a head of broccoli opens into a flower the color of sunshine. A bolted head of broccoli is a worthy bouquet in itself. Rainbow Chard’s broad stems come in magenta, orange, white, crimson, and yellow. And these succulent leaves can be munched right from the bouquet! Mexican Mint Marigold, when in flower, features daisy-shaped golden flowers. Even when it’s not blooming, this herb’s licorice scent and attractive, bright green leaves make it a lovely addition. Rosemary in Central Texas is in full bloom. Snip a sprig to add mouth-watering fragrance, deep grey-green foliage, and delicate lavender-colored blossoms to your bouquet. Culinary sage, which comes in light grey-green and dusty purple, adds scent, color, and texture. Other herbs in the mint family (Lamiaceae), like oregano, thyme, and peppermint add greenery, texture, and fragrance. Herbs in the Umbelliferae family, including parsley, cilantro, and dill, have flowers shaped like tiny fireworks exploding. Who wouldn’t love receiving a bouquet with fireworks in it? Mix and match these to create a bunch that strikes your fancy! 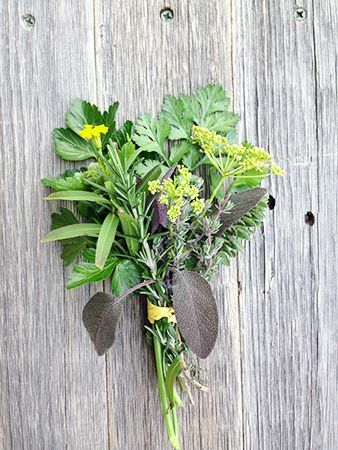 An alternative idea is to create a bouquet that includes strictly herbs. This idea is not new--the French use bouquet garni (garnished bouquet) to flavor a variety of soups and other dishes. Herbs including thyme, bay leaf, and sometimes parsley, rosemary, and tarragon (which does not grow well in Central Texas but for which Mexican Mint Marigold provides an excellent substitute) are bound with a string or in a cloth bag or cheesecloth. Bind yours like a bouquet, and your lucky love can cook dinner with it later!